Tickets are now on sale for our Christmas 2018 concert at the Civic Centre in Castleford on Friday 14th December at 7:30pm. As usual, kids go free and adults tickets are just £7 each (that's 50p cheaper than last year!) PLUS if you buy them before 16th November, you can save even more as they are only £6 until then. Surely they have to be the best value tickets in town this Christmas?! Some of our band and choir member helped run a stall at Pontefract Park on Saturday 15th September as we kick-started our 2018-19 season with some promotion at the Five Towns Community Day. Our concert 'An Evening of Music on the Lanes'. took place on the evening of Friday 13th July at Carlton Lanes Shopping Centre to raise money for our 'Defbirillators for Castleford' Appeal. The evening was a great success with an audience of over 100 people enjoying a wide range of music from our concert band and choir. We're still waiting for the total amount raised on the night, but with over £280 raised from the raffle alone, a big 'thank you' has to go to everyone who bought tickets. Thanks also to Loubie Lou's, Sisters Ladies Fashionwear, Bill Plant Driving School by Scott Tomkinson, KL Hairdressing, and the staff at Dorothy Perkins and Marks & Spencer and for donating some brilliant raffle prizes. CYM were recently invited to perform at the 10th Anniversary celebrations of the Castleford Footbridge. CYM are pleased to announce the launch of a new joint fundraising campaign with Carlton Lanes to bring much needed defibrillators to Castleford town centre. We are aiming to raise enough money to locate two automated external defibrillators (AEDs) in the Shopping Centre which will be available for use by members of the public should the need arise. AEDs are lightweight portable devices used in cases of sudden cardiac arrest (SCA) that check the patient’s heart rhythm and can send an electric shock to the heart to try to restore a normal rhythm. SCA can lead to death if it’s not treated within minutes; in fact each minute of SCA leads to a 10% reduction in the chance of survival. AEDs are intended to be used by the general public to allow early treatment of the patient until the emergency services arrive. Castleford Young Musicians will be raising money through various fundraising events, donations and collections at concerts, but we're very pleased to announce that 100% of the profit from our Annual Concert at the Civic Centre on Friday 11th May will go towards this appeal. Very pleased to announce we have been successful in our application for £500 from Wakefield Council’s Neighbourhood Improvement Fund. This will go towards replacing our well used music stands which have served us well for over 15 years, but they have certainly seen better days! 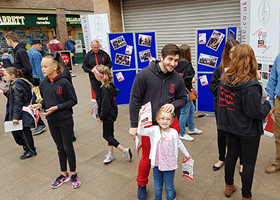 A big thank you to those who volunteered during our promotional morning on 9th September at Carlton Lanes Shopping Centre, Castleford. We gave out plenty of leaflets and had some interest, so hopefully this results in a few new members for our band and choir! Congratulations to Alfie Southernwood (Grade 1) and Maxx Lancaster (Grade 4) who both passed their recent Saxophone exams! We've just added a new concert to our events page - a performance at St Joseph's Primary School in Castleford on Friday 7th July to raise money for the Cystic Fibrosis Trust. As this is the same venue as our planned rehearsal, the evening will begin with refreshments at 7pm with the concert beginning at 7:30pm. Tickets will be available on the door and are priced at £5 adults, with children just £2. Castleford Young Musicians are very sad to announce the passing of one of our founding members David Lorriman. A service to celebrate his life will take place at Castleford Christadelphian Hall, Hartley St, off High Oxford Street, Castleford, WF10 5DQ on Thursday 2nd February at 11:45. 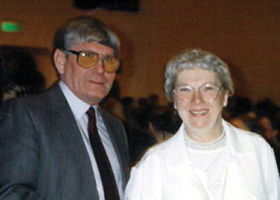 Our condolences to his wife and former Choir Director Vera and their family. Happy New Year to all our members, friends, family and supporters! 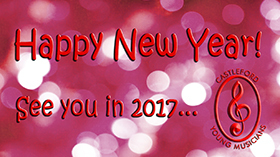 See you all in 2017! When? Have a look at our events page! Our Annual Christmas Cabaret Concert on 16th December at Castleford Civic Centre, sponsored by Handelsbanken Castleford, brought our very busy Christmas period to a close. It followed concerts the previous two weeks; the first being our joint concert with Castleford Male Voice Choir at Pontefract Central Methodist Church followed by a performance of Christmas music at St Paul's Church, Glasshoughton, on 9th December. The concert was also our final meeting of 2016 - our unforgettable 50th Anniversary year! We now look forward to a busy 2017 (see our events page for details), but before then we would like to wish all our members and supporters a very Merry Christmas and a Happy New Year! Our reunion social event on 2nd September 2016 marked the end of our 50th Anniversary celebrations, with members past and present coming together to share memories of their time with CYM. It's been a very busy year, with the production of a CD and DVD, as well as our Anniversary Concert in May. If you're a past member and haven't yet requested your free copy of our CD or DVD, click here! Congratulations to Committee and Choir member Jade on her recent marriage to fellow Choir member Lee Gray in the Lake District. We wish you a long and happy future together! Castleford Young Musicians have recently signed up with 'Making Music', the UK's number one organisation for voluntary music groups. We're looking forward to discovering the benefits of being members of this organisation through the rest of this year and beyond! For more details about 'Making Music' visit them at www.makingmusic.org.uk. Our Child and Vulnerable Adults Protection Policy and our Health and Safety Policy are now available to view on our Policies page, or to download from our Downloads page. Castleford Young Musicians are sad to announce the passing last week of Geoff Marshall. Geoff was a very active supporter of our group in the 80’s and 90’s while his son Phil was a member of the band, organising many fundraising events and taking on the role of Chair of the Parents Group at the time. His funeral will take place at Kettlethorpe Crematorium on Friday 28th October at 11am. Our concert on 6th May 2016 at St Matthew's Church, Chapel Allerton, Leeds, LS7 3QF with the brass tentet, Yorkshire Evening Post Brass went very well. Thanks to Diane Carlisle for organising the event. We started 2016 with a members social event, roller skating at The Hut in Airedale. This followed an enjoyable night bowling there last year. Our Annual Christmas Concert at the Civic Centre on 11th December lived up to its reputation as one of our most popular concerts of the year with a bumper audience enjoying a wide range of Christmas music from our Concert Band and Choir. Thanks to everyone who attended and once again a big thank you to Handelsbanken for sponsoring the concert. The following week, we ended 2015 with a short Christmas Concert at Castleford Library. A very cosy venue, but appreciated by the Friends of Castleford Library. Our performance as guests of Castleford Male Voice Choir took place on Friday 16th October 2015 at the Civic Centre in Castleford, in their annual Patron's Concert. 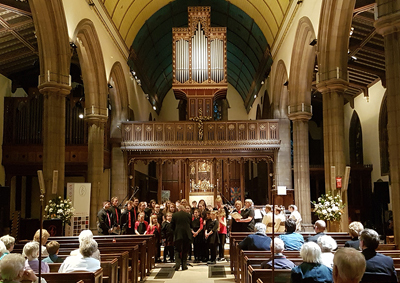 This was the first time the two groups had performed together in a joint concert, and judging by the comments at the end of the night, it was a great success! 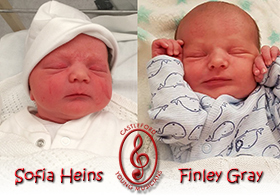 Congratulations to Callum Ferrier on passing his Grade 8 Clarinet, Grade 8 Guitar AND Grade 6 Drums recently! 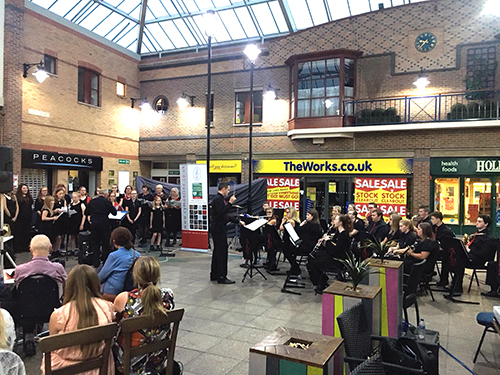 Our Annual Concert at the Civic Centre in Castleford in May 2015 was once again a great success. The concert featured a number of brand new items, as well as solos from Chloe Wilson in the choir and band member Liam Oxley on Saxophone. Band Director Phil Clarkson performed Stranger on the Shore, accompanied by Steven Dixon on piano, to remember the well-known Clarinettist Acker Bilk who passed away at the end of last year. A number of presentations were made on the night; Kath Smart was announced as Vice-President for the coming year and choir member Jade Sinfield was formally accepted onto the Executive Committee. Band member Steven Dixon’s recent promotion to the Committee was also recognised. Awards were made to long serving choir members Faye Burke and Lee Gray, and band member Becky Brocklehurst. Attendance awards were presented to Liam Oxley and Jasmine Toal in the band, and Matthew Williamson and Chloe Wilson in the choir. Certificates of appreciation were also made to the six choir members who recently represented CYM at Pontefract Music Festival; Darcey Crewe, Georgia Griffiths, Sophie Hockney, Alice Lindley, Daisy Pyrah and Chloe Wilson. Congratulations to all our award winners and thank you to those who contributed to the £146 raised by the raffle. With this Annual Concert now complete, we turn our attentions to our 50th Anniversary Gala Concert in twelve months’ time. Keep an eye out for details of this, plus all the other performances and events scheduled in the meantime. Congratulations to all our members who represented us in Pontefract Music Festival recently. Well done to Georgia Griffiths for coming third in Prepared Reading, and to Chloe Wilson and Darcey Crewe for receiving Credits for their singing performances. In Verse Speaking, well done to Sophie Hockney and Alice Lindley for their Credits and a special congratulations to Daisy Pyrah for coming first place in her class! They all performed and represented CYM really well so a big 'Well Done' to them! The singers were accompanied on the piano by band member Steven Dixon who did a brilliant job too! Our first meeting after Christmas, on 9th January was a member's social event, with ten-pin bowling at The Hut in Airedale. It was a great way to start the 2015 season; many thanks to everyone at The Hut for their hospitality. Our Christmas concert at the Civic Centre on 12th December 2014 was once again a great success. Featuring several brand new items in both the band and choir programmes, plus a special performance of 'You Raise Me Up' by Ralph, Phil, Richard and choir members Lee and Matthew! Thanks to all who attended, and Merry Christmas to all our members and supporters! Congratulations to Phil Clarkson and Sarah Dyson on their wedding at the end of July 2014. Presentations were made to the happy couple towards the end of the concert in Scarborough from both CYM as a whole, and the band more specifically. Thanks to everyone who came to see our performance in Scarborough on 12th July 2014. Once again our members had a good day out in the amusements and on the beach, and enjoyed a great concert at Queen Street Central Hall in the evening. Our presentation concert at the Civic Centre on 16th May 2014 saw 10 year awards presented to band member Billy Beacroft and (in absentia) Emily Driscoll in the choir, along with attendance awards for Liam Oxley (Band) and Matthew Williamson (Choir). Congratulations to them all! The position of Vice President, which exists as an annual rotation between members of the Committee was passed from Phil Clarkson to Diane Carlisle. "A massive thank you for last night. What a great evening. Such a bunch of talented people. I can appreciate the hard work and dedication from all concerned that has to go into producing a performance of that quality. The feedback from those attending was great. My personal highlights was the Mamas and Papas (ex hippie!) and the Gershwin medley. Please forward this email to those who participated and I hope we can work together again. Band and Choir members donned their hoodies at a recent rehearsal to show the funding organisation 'Positive Choices' that their money has gone to good use. It's great seeing our members out and about in the local area advertising our group! Congratulations to choir members Alice Lindley, Daisy Pyrah, Sophie Hockney, Darcy Crewe, Evie Griffiths, Lucy Marshall, Brodie Westwood, Chloe Wilson and Ellie White, who all represented CYM in the 2013 Pontefract Music Festival! 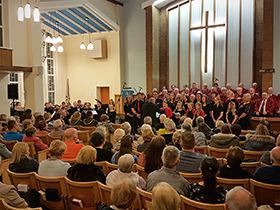 Our concert at Trinity Methodist Church in Castleford on 27th September 2013 was a great success, raising over £400 for Blind Veterans UK. Many thanks to all who attended. Band and Choir members donned their hoodies last night to show the funding organisation 'Positive Choices' that their money has gone to good use. It's great seeing our members out and about in the local area advertising our group! Our concert at Trinity Methodist Church, Castleford, on 17th May 2013 raised over £500 for the Trinity Mission Night Shelter and Drop-In Centre. A big thank you to our enthusiastic and generous audience! Our Annual Presentation Concert on 15th March 2013, sponsored by Handelsbanken, helped raise over £600 for Yorkshire Air Ambulance. Many thanks to our wonderful audience for helping us raise so much. Awards on the night were presented to Flautist Victoria Mallory for 10 year's service, and choir member Alice Lynch and Saxophonist Chris Camm for 5 years. It was Band Director Phil Clarkson's turn for the Vice Presidency, taking over from Richard Forster in this position's annual rotation. A great result at the Positive Choices funding event in February 2013 helped us fund new, specially designed hoodies for all our existing and new members. This is one of several initiatives we are trying to help us grow our membership. CYM are still looking for someone to come along and help our Choir Director. Hopefully this would eventually lead to taking over the directorship of the choir. This is a voluntary position and rehearsals are held on Friday evenings 7pm-9pm (term time only). This would be a great opportunity for anyone who enjoys choral work with a membership of young people aged between 8 and 25 years. For any further information or interest, please contact our secretary on (01977) 511971.